Hello again from the state of Tennessee! 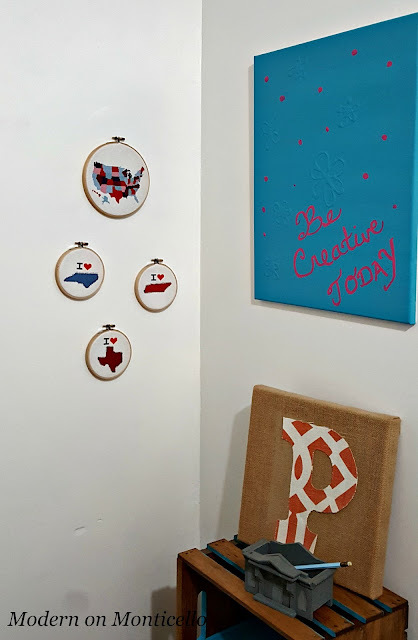 This is Donna from Modern on Monticello blog and I'm here to bring you a fun project that is not only adorable but will also help to use up those small little scraps of fabric you may have in your craft stash combined with a fun cross stitch pattern. 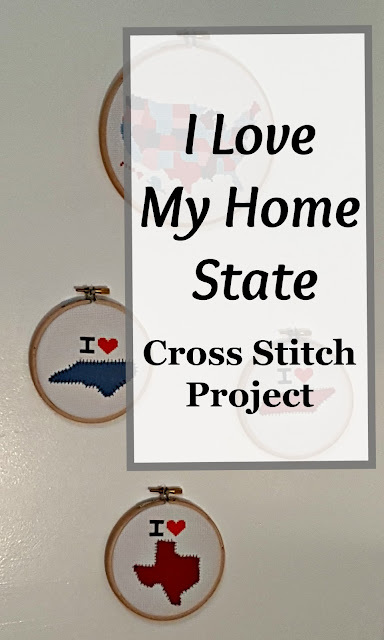 I'm an avid cross stitcher - if that is the correct term for it - and I can spend hours just making little tiny x- marks with thread and watching movies. To start this project I created a simple pattern with a free online software called Stitch Fiddle. 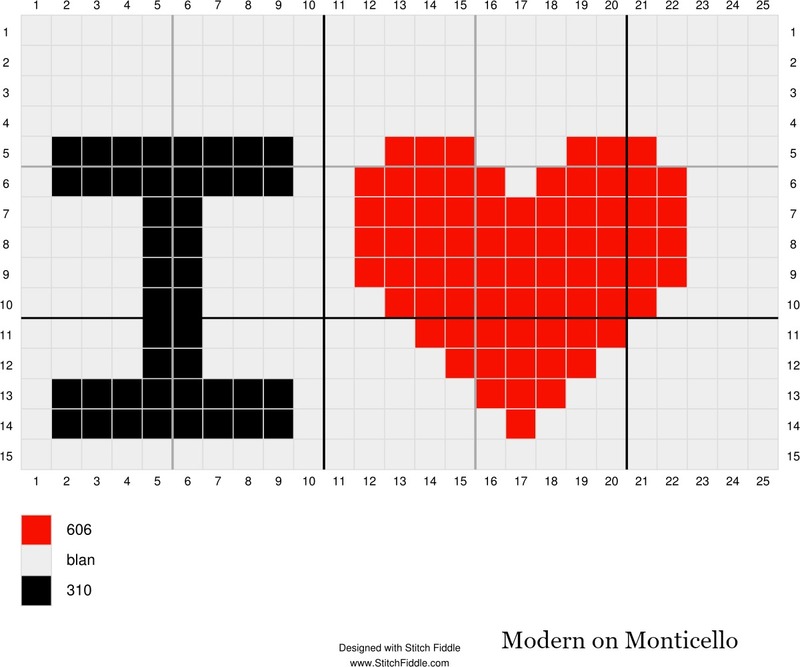 My pattern is very easy so a free software was the best way to go to create this pattern. 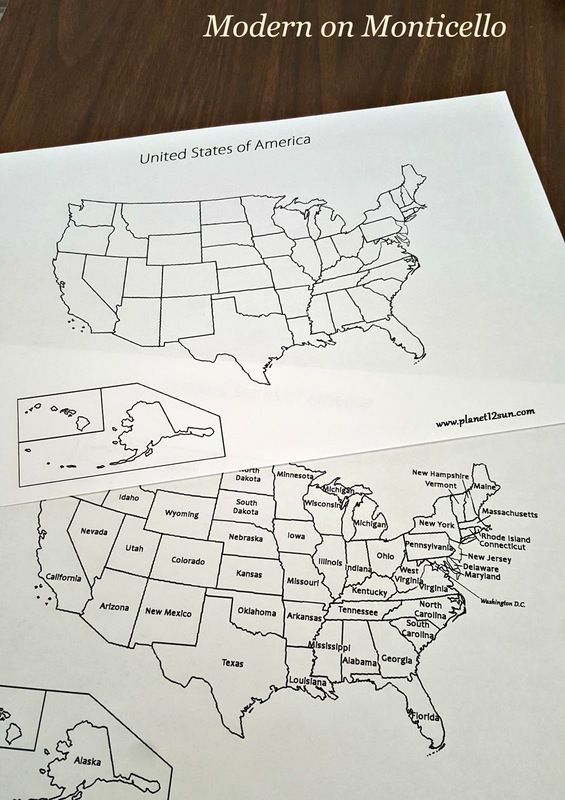 For starters, I searched online and found a few maps of the United States showing all the states. I had to print out a copy, scan it back into my computer, and they enlarge it to get the states I needed to a bigger size for the project. You may have to do something similar or may be able to print it out at the correct size the first time. As long as it fits within the 4" embroidery hoop you should be okay. I then cut out around the outline of each state I was making to use as a pattern. 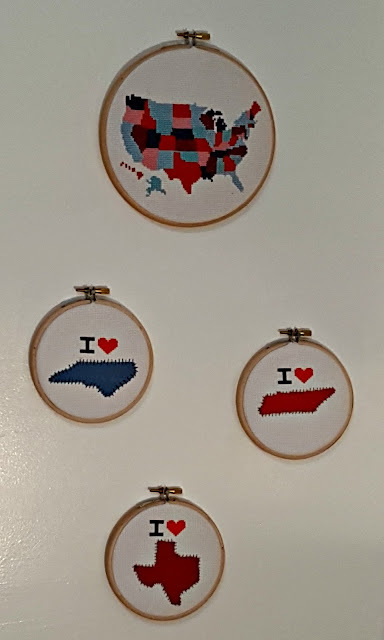 I have actually lived in three states so I decided to make a project for all three. I was born and raised in North Carolina, the military moved us to Texas for a few years, but we decided to settle in the mountains of Tennessee where we have lived for 16 years now. I pinned the state patterns to my fabric and cut out each little state. 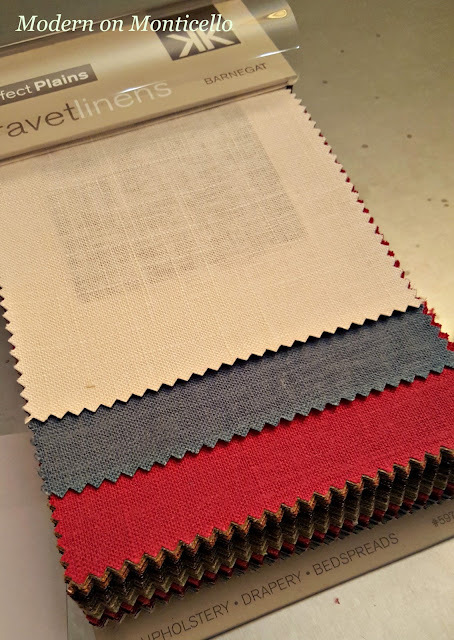 I decided to go with just solid fabric for each cutout so I used some of the fabric I have in my stash of designer fabric samples but you can use whatever you have on hand. 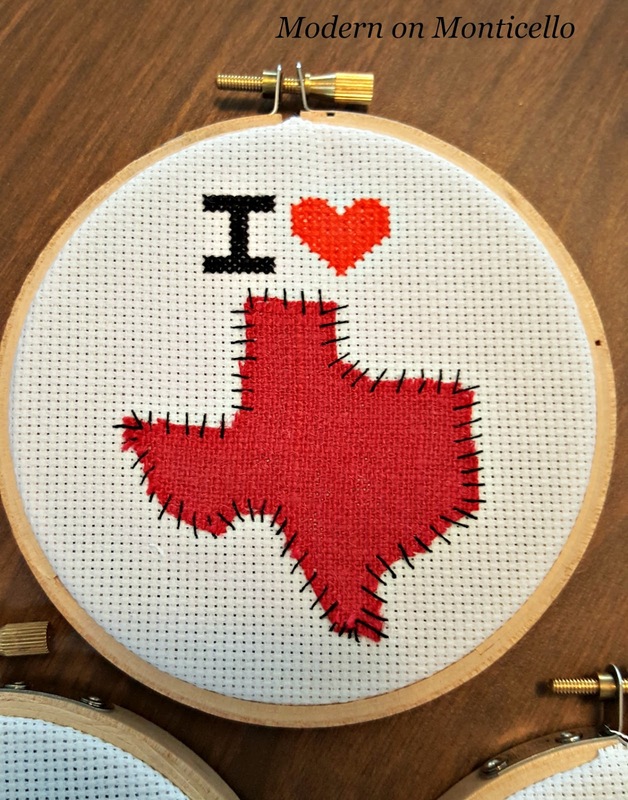 To make the I Heart symbol, I stitched the pattern below on to the Aida cloth using two strands of thread. 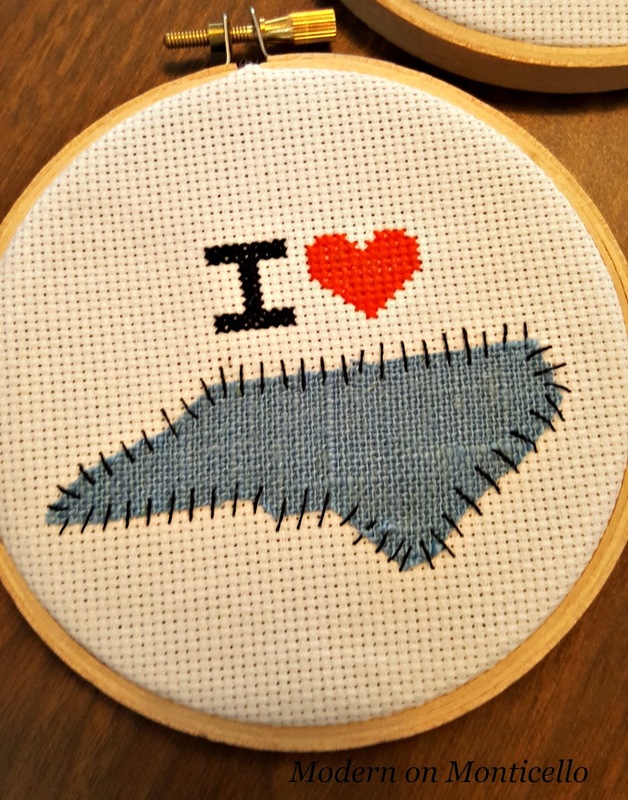 After stitching three sets of this pattern, I attached the state cutouts with Modge Podge to the Aida cloth and centered below each stitched pattern. I allowed this to dry overnight. 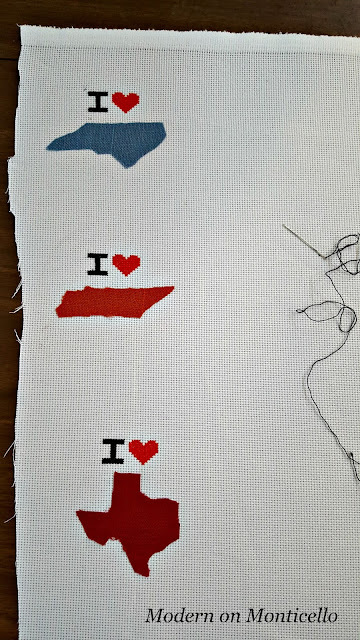 The next step I added as a necessity because my choice of woven fabric was fraying apart around the edges so I added the detail of a very primitive looking stitch around each state cutout resembling old quilt stitches. Not fancy but it holds the fabric in place. See you next month with hopefully another fun project. really, really cute and creative! Embroidery Design Love it! Will have to use this idea sometime.